Lemon-ginger tea is an infusion of lemon juice and ginger root rather than a true tea. True teas are made by steeping leaves of various herbs in hot water, usually in a steel tea strainer or cloth-like bag. The pleasant, citrus scent of lemon combined with the pepper-spice scent of ginger provides a relaxing opportunity to pamper your senses and recharge your spirit. 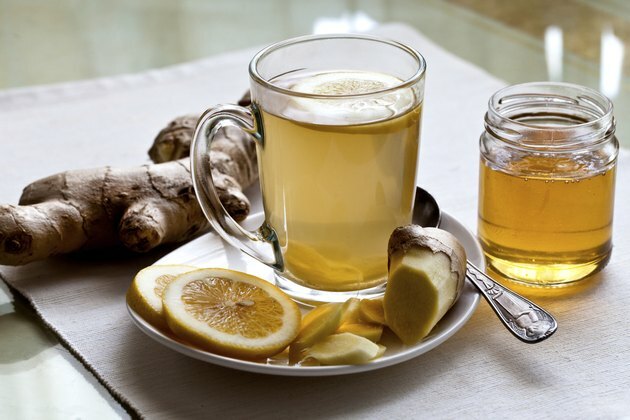 Drinking lemon-ginger tea will help prevent salmonella and other bacterial infections, thanks to ginger's active ingredient, zingiber, and the immune-boosting action of the pectin and limonene in lemon. Ethanol-based ginger extract killed salmonella typhi bacteria, according to T.E. Ayogu, PhD, in a 2009 study published in the "Internet Journal of Third World Medicine." Drinking lemon juice mixed with honey and hot water every two hours helps reduce fever, says online magazine "Living Life ... Boomer Style." Ginger is a diaphoretic, which means it induces sweating. Sweating releases dermcidin, a natural antibiotic which helps strengthen the immune system and fight off infections and viruses, according to the 2012 issue of the "Journal of Innate Immunity." Herbal teas get names like "Lemon Lift" for good reason. The scent of lemons increases concentration, insists "Living Life ... Boomer Style." She recommends drinking lemon water every few hours. Sipping warm ginger tea with lemon can relieve tension, providing a welcome break during intense study sessions, after a strenuous workout or before a high-stakes presentation at work.